SourceMedia is a digital marketing company based in New York City. 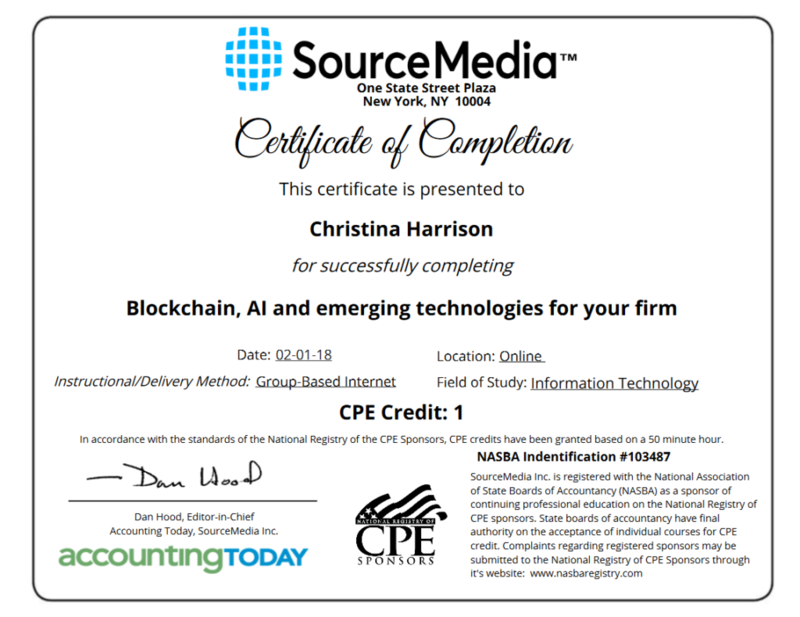 Accounting Today, which is a publication managed by SourceMedia, routinely produces webinars that are approved for CPE accreditation. SourceMedia has utilized SimpleCert as their Certificate Management System since 2016. SimpleCert’s online certificate generator is ideal for CPE certification needs. Uploaded CPE recipient lists are automatically archived into the Store Module of an administrator’s account, where they are permanently archived. This automatic storage ability of the tool makes it easy to comply with NASBA’s requirements for record keeping for a CPE administrator. Being a monthly subscriber to SimpleCert, Accounting Today also utilizes the Recipient Portal feature. With the recipient portal, each recipient of an Accounting Today CPE certificate can set up their own personal certificate portal to access and store their certificates. If that same person receives further CPE certificatesfrom Accounting Today, those certificates also post automatically into that recipient’s portal. This feature, which is automatically included for monthly subscriptions, is wildly popular with recipients who can conveniently store and access their certificates at any time.